1) EnsurePass Questions & Answers are compiled by Senior IT Professionals and Experts who have years of experience in IT certifications field.So our products could cover 100% of the knowledge points and ensure good results for every customer. 2) EnsurePass continues to update the Questions & Answers depending upon the change of the Real Exam questions, which is to guarantee the question coverage more than 95%. 3) EnsurePass Team provides 24/7 after sale assistance.So if any professional problems puzzle you, just contact our experts at any time. 4) We Guarantee your success at your first attempt. EnsurePass Products are all you need for a successful certification exam. All of the above features make us so confident that we offer Full refund if you fail any Exam at first attempt. When and how do you ask for a refund if you fail the exam? 1) Send us your original Examination Score Report in PDF format within 7 day of Test to [email protected] with your login email address. 2) After receiving your request, our staff will handle your requests timely. If your request has been accepted, we'll send you confirmation that the refund has been handled. It can take 5 to 7 business days for the money to reach your account. In the case of a bank transfer refund, it can take up to 2 weeks. 1) Retired or Wrong Exam purchase EnsurePass.com will not entertain any claims once the product is received. 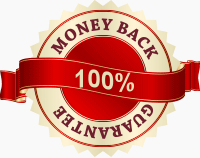 2) Guarantee can't be claimed on any exam material that was provided for Free or any exam purchased on discount. 3) Expired order that are no longer accessible or outdated exam products for which update is already released. 4) No Guarantee can be claimed if EnsurePass.com were not informed about in advance ( at least 3 days) about the exam date by the candidate EnsurePass.com holds the right to make the final decision regarding claim of FREE Update or Refund. 7) Guarantee Policy is not applicable to ACTC, Avaya, CISSP, Oracle, EMC, HP, IBM, Mac OS X, PMI, SSCP, SAP and GIAC exams as www.ensurepass.com provides only the practice questions for these. For those who give up full refund and want to exchange products, EnsurePass would like to offer two free study materials. If other cases that are not on the list appear, EnsurePass Reserves Final Interpretation Rights. 9) One fails the exam within 7 days (7 days included) after the purchase. Although our Question & Answers are complete enough for you to understand all the knowledge points, yet less than 7 days is too short a time to learn it well. We offer you 365 days of free updates, which means you get updates without any cost within 365 days of purchase. To claim Free Update for the exam material the request must be submitted within 60 days from the purchase date by email to [email protected] with your login email address. EnsurePass.com will arrange the update within 10 days after receiving all of the above mentioned details! Give it a try and you will lose nothing!